Yes, yes, it’s me. I’m blowing the dust off the old blog and getting things moving again. I have a new broom and I intend to get this cobwebby place ship-shape once more. I will not stop mixing metaphors until it’s done. So, I know things have been a bit—ahem—slack around here for a while. I could make excuses about dogs eating my homework or my spiralling despair at not being an internet millionaire quickly enough but you don’t want to hear that. 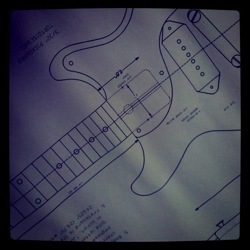 Nope, what you want is guitar geekery. And that’s what you’ll get. I’m back on the horse with a slightly more relaxed attitude to stuff. I’m not going to beat myself up trying to get X number of posts a week. Instead, I’ll post on stuff that genuinely interests me and that I hope will interest you. I’ll give you my opinion on stuff (won’t that be riveting) and will pass on information and photos on some of the jobs that have come through the workshop. Hopefully, there are still a few people with the Guitarless feed lurking in their RSS-readers. If so, sorry for the absence and I hope you’ll stick around/tell your friends/send money to make me an internet millionaire.